SKU: SC RG86. Categories: Abalone, Rings, Shiva Eye. This large handcrafted heart ring is fully adjustable and completely natural. 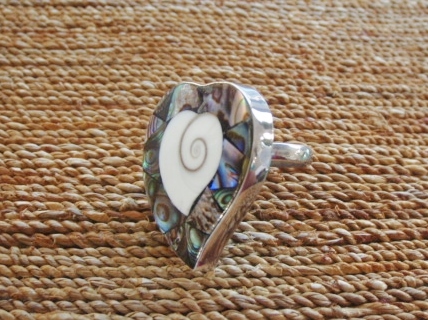 It has been made using the Abalone & Shiva Eye seashells. 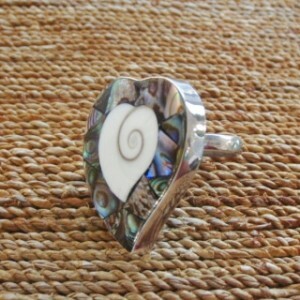 The Abalone shell is amazing. The iridescent colours below the surface of the shell reflect the colours of the sea. The ripple effect looks like waves. The Shiva Eye is the protective doorway to a Turban Snail. When it falls off it washes up on the beach. Its quite hard to find, but look for the distinctive swirl on its white side or the browny/greeny eye on the other side. Set in 925 Sterling Silver, this combination is sure to wow. Team it up with the matching Pendant and/or earrings to cause a stir!